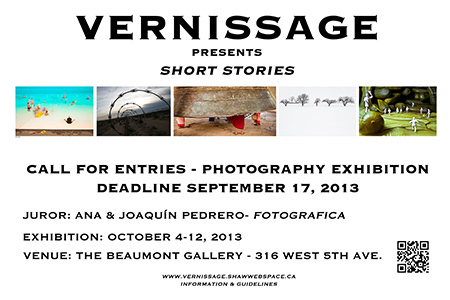 Framagraphic is pleased to offer discounted custom framing services for photographers interested in submitting work to Vernissage’s Short Stories photography exhibition. The call is free of charge, and open to all Lower Mainland photographers. This juried group exhibition will examine contemporary story telling through a series of images exploring personal, familial, cultural and/or universal imagery. The jury is looking for a cohesive series; perhaps an excerpt from a larger body of work. Photography is often associated with documentary- the photograph being a record of something that was, or something that happened. It is also often associated with truth- with dutifully recording what appeared before the lens. Where story comes in to a photograph is not as easy to identify. The lens snaps shut in an instant. Movement is frozen, mouths are caught open, and time, which is essential to story telling, is eclipsed. This challenge posed by Short Stories, to present still images with the capacity to speak, is sure to bring forth a host of interesting and compelling photographs. The finalists will be exhibited at the Beaumont Gallery October 4 – 12.